Forecasting exhibition attendance is an unpredictable science. Who would have thought that the six-foot-high plaster model of a statue of Abraham Lincoln would attract 9,290 visitors a day to the National Gallery of Art, Washington, DC? “Designing the Lincoln Memorial” lacked the magic words “treasures”, “impressionism” or “gold” in the title and yet it attracted 2.9m visitors in total, putting it third overall in The Art Newspaper’s 17th ­annual survey of attendance figures. See the article, or a PDF on the top 30 exhibitions, plus tons of other data on total art museum visitors, various “top ten” lists, . 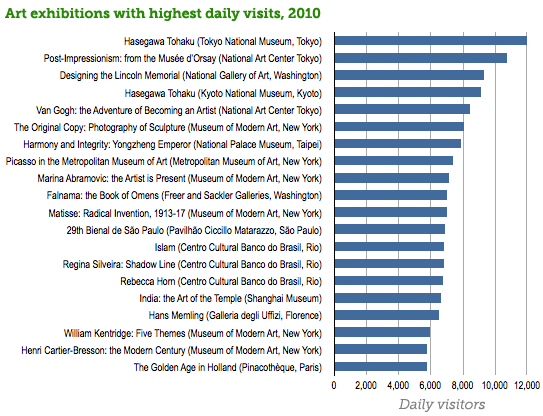 The data only includes museums who reported attendance rates for exhibitions to The Art Newspaper.